Loved everything about our cruise on the Celebrity Equinox (husband and i). Maybe it was because we were cruise virgins but we had a fabulous time in this lovely ship sailing around the Eastern Caribbean. We stayed in Miami for 3 nights before setting sail and really enjoyed touring round the different sites in both Miami and Miami Beach. On the day we were to set sail we caught a taxi to the port. Embarkation was calm and smooth and a couple of hours later we were able to go to our balcony cabin on the 8th deck (aft) Room was so comfortable and quiet and spotlessly clean. All the staff were lovely and extremely attentive. Our cabin steward Kadek was brilliant and was always there to give us a cheery welcome. We ate in the silhouette Dining room and also had specialty cuisine at Tuscan Grille which we enjoyed immensely but to be honest we enjoyed the less formal way of eating at the Oceanview cafe. The variety and quality of food we thought was excellent. The entertainment was good and we went to the theatre several times. We booked our own excursions separately and we found this worked very well and were much better value. 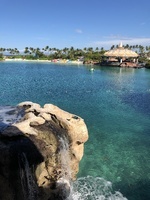 The ports of call to San Juan, St Maarten, St Thomas, Punta Cana and Nassau were all enjoyable. On arrival back at Miami disembarkation from the ship was well organised but Miami port was chaotic with several large cruise liners having returned the same day. We were lucky to find our taxi amongst the throng of people and traffic. We are already looking at our next cruise and will definitely be considering Celebrity Cruises.